Purpose: The aim of this study was to evaluate the effect of initial intravitreal ranibizumab injection on visual acuity (VA) and central macular thickness (CMT) for the treatment of macular edema (ME) with and without serous retinal detachment (SRD) secondary to branch retinal vein occlusion (BRVO). Materials and methods: Fifty-two BRVO eyes, treated with intravitreal ranibizumab injection for ME with and without SRD, were retrospectively reviewed. Patients were divided into two groups according to spectral domain optical coherence tomography (SD-OCT). The efficacy of intravitreal ranibizumab injection at first month was assessed by analyzing the change in best-corrected VA and reduction in CMT with SD-OCT. Results: There were 21 patients with SRD and 31 patients with only CME (no-SRD). CMT was significantly greater in the SRD group than in the CME group (451±62.2 µm vs 383.5±37.2 µm, respectively, P<0.05). After initial intravitreal ranibizumab injection, mean VA improved from 0.87±0.26 logarithm of the minimum angle of resolution (LogMAR) to 0.54±0.27 LogMAR (P<0.01) and CMT decreased from 451±62.2 µm to 379.3±58.6 µm (P<0.001) in the SRD group. In the no-SRD group, mean VA improved from 0.69±0.25 LogMAR to 0.44±0.25 LogMAR (P<0.001) and the CMT decreased from 383.5±37.2 µm to 337.7±39.4 µm (P<0.001) at the first month visit. Eyes with SRD revealed better anatomic results and greater reduction of CMT after intravitreal ranibizumab injection (P<0.01). Conclusion: VA and CMT can be improved by intravitreal ranibizumab injection in BRVO patients with and without SRD. However, more marked improvement in macular morphology was achieved in patients with SRD than those without SRD. Optical coherence tomography (OCT) studies have revealed that ME secondary to BRVO is frequently associated with cystoid macular edema (CME), serous retinal detachment (SRD), and inner retinal thickening. 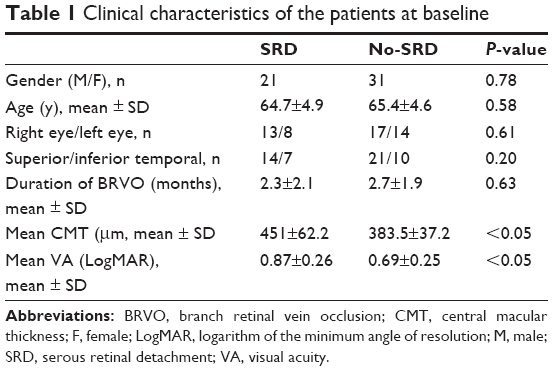 SRD, which is associated with several ischemic, inflammatory, and neoplastic diseases, has been reported in 15%–80% of patients with BRVO.2,10,11 Although the mechanism of SRD is not completely understood, extensive leakage from retinal circulation into the subretinal space exceeding its drainage capacity may lead to accumulation in the subretinal space and cause serous detachment.12 Also, pathogenesis of SRD can be related to inflammation that enhances vascular permeability and dysfunction in various retinal structures. Recently, studies showed that SRD and loss of the photoreceptor layer damage the retinal pigment epithelium and neurosensory retina leading to a poor visual prognosis in BRVO.13–15 However, there are a limited number of studies that assess treatment outcomes in eyes with SRD in BRVO. The aim of this study was to evaluate the effect of initial intravitreal ranibizumab injection on VA and CMT for the treatment of ME in eyes with and without SRD secondary to BRVO. We retrospectively reviewed the medical records of patients, who had ME secondary to BRVO and were treated with intravitreal ranibizumab injection, examined at the Department of Ophthalmology, Sakarya University Medical Education and Research Hospital, and Namik Kemal University, Department of Ophthalmology, from February 2014 to January 2016. This study was performed in accordance with the Declaration of Helsinki. Prior approval to review the patient data was taken from the hospital directories (February 2016). Written informed consent was taken from all the patients. Because this is a retrospective study, there is no need for institutional reviewer board approval in accordance with the rules declared by the Ministry of Health of Turkey. Exclusion criteria included prior ocular surgery, retinal, optic disc or iris neovascularization, diabetic retinopathy, previous laser photocoagulation and/or intravitreal injection, current use of systemic steroids and/or immunomodulators, clinically significant media opacity, presence of vitreomacular traction detected by OCT, history of ocular inflammation, and marked retinal hemorrhage (including macular bleeding involving the fovea). On initial examination, patients underwent complete ophthalmologic examination, including VA measurement, slit-lamp biomicroscopy, fundoscopy, fundus color photography, fluorescein angiography, and spectral domain OCT (Cirrus, version 6.5.0, Carl Zeiss Meditec Inc, Dublin, CA) analysis (512×128 macular cube acquisition protocol) to measure the CMT and evaluate the absence or presence of CME/SRD. Best-corrected VA was measured by Snellen chart and then converted into logarithm of the minimum angle of resolution (LogMAR) for statistical comparison. OCT images were obtained from each eye following pupil dilation by the same operator. The retinal thickness was defined as the distance between the inner surface and the outer surface of retina. CME was defined as hyporeflective intraretinal cavities in cross-sectional scans radiating from the center of the macula. In contrast, SRD was defined as the presence of nonreflective cavity with minimal shadowing of the underlying tissues due to subretinal fluid accumulation leading to detachment of the neurosensory retina. Patients were divided into two groups according to spectral domain OCT findings of SRD and CME: patients with only CME (Group No-SRD) and patients with SRD (Group SRD). All the eyes in the SRD group also had CME. The BRVO eye was anesthetized with topical anesthetics and prepared according to standard clinical practice for eyes undergoing intravitreal injection. Intravitreal injection of 0.5 mg/0.05 mL ranibizumab was performed under sterile conditions with a 30-gauge needle. Immediately after the injection, ciprofloxacin ointment was given for 1 week. After the initial injection of ranibizumab, patients were followed up on the first day, third day, and seventh day and 1-month intervals with VA measurement and OCT analysis with the 512×128 macular cube acquisition protocol of the Cirrus HD OCT. This study investigated the first month’s results of initial intravitreal ranibizumab injection. Statistical analysis was performed with Python version 2.7.6 and SciPy library version 0.13.3. Results are presented as mean±SD. Welch’s test was used to compare normally distributed unpaired continuous variables between the groups. Two-tailed P-values of <0.05 were considered to indicate statistical significance. A total of 52 eyes of 52 patients met the inclusion criteria and were enrolled in the study. The mean patient age was 64.9±4.9 years (range, 53–76 years). Each patient had unilateral BRVO and ME. The patients were divided into two groups according to the presence of SRD. There were 21 patients with SRD and 31 patients with only CME (no-SRD). All the 21 patients in the SRD group had both SRD and CME. There were no differences between groups with regard to gender, age, laterality, and duration of BRVO. Table 1 describes the demographic characteristics of the study population. Abbreviations: BRVO, branch retinal vein occlusion; CMT, central macular thickness; F, female; LogMAR, logarithm of the minimum angle of resolution; M, male; SRD, serous retinal detachment; VA, visual acuity. At baseline, VA was significantly worse in the SRD group than in the no-SRD group (0.87±0.26 vs 0.69±0.25, respectively, P<0.05). Also, CMT was significantly greater in the SRD group than in the CME group (451±62.2 μ vs 383.5±37.2 μ, respectively, P<0.05). In the analysis of each group, we found significant improvement in VA and reduction in CMT between the baseline and the final follow-up visits after intravitreal injection of ranibizumab. In the SRD group, mean VA improved from 0.87±0.26 LogMAR at baseline to 0.54±0.27 LogMAR (P<0.001) at the final visit. The CMT decreased from 451±62.2 μm to 379.3±58.6 μm (P<0.001). In the no-SRD group, mean VA improved from 0.69±0.25 LogMAR at baseline to 0.44±0.25 LogMAR (P<0.001) at the first month visit, and the CMT decreased from 383.5±37.2 μm to 337.7±39.4 μm (P<0.001). The final VA and CMT parameters were better in patients with SRD group after initial intravitreal ranibizumab injection (P=0.13 and P<0.01, respectively) (Figures 1 and 2). 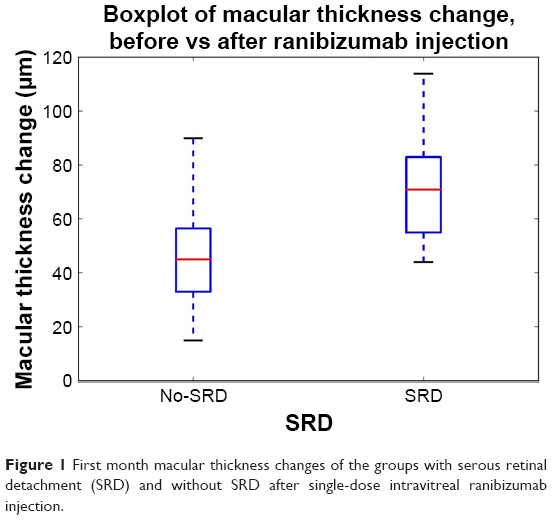 Figure 1 First month macular thickness changes of the groups with serous retinal detachment (SRD) and without SRD after single-dose intravitreal ranibizumab injection. 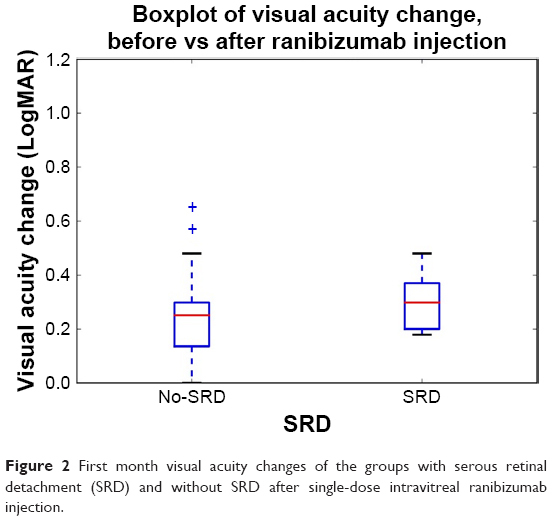 Figure 2 First month visual acuity changes of the groups with serous retinal detachment (SRD) and without SRD after single-dose intravitreal ranibizumab injection. In the present study, we investigated the prognostic value of SRD on VA and CMT after first intravitreal ranibizumab injection in BRVO patients with ME. Before intravitreal injection, the mean VA was significantly worse in the SRD group than in the CME group and eyes with SRD had greater CMT. A significant improvement of the VA and resolution of the SRD were found after the initial injection of ranibizumab in both groups. However, eyes with SRD revealed better anatomic results and greater reduction of CMT after intravitreal ranibizumab injection. Another possible mechanism suggested for the development of SRD is vitreal hyperosmolarity which flows the fluid from the vitreous to the choroid.20,21 Ota et al declared that also small breaks on the external surface of the neurosensory retina, which connects the swollen outer reina, could be responsible for SRD.10 Tsujikawa et al reported that Müller cell cone traction due to formation of foveal cystoid spaces would lead to traction on the inner and outer segments of the foveal photoreceptors and loss of the barrier function of the external limiting membrane, which will cause diffusion of intraretinal fluid into the subretinal space and increase of SRD.13 Formation of SRD causes damage to photoreceptors in the outer segment and impairment of VA.
Retinal vein occlusion pathogenesis involves a cascade of immune and inflammatory changes.2 Pfister et al assessed the levels of inflammatory and angiogenic cytokines in untreated BRVO patients with ME and correlated the results with OCT parameters. They found that VEGF-A was more often correlated with the morphologic changes such as SRD.27 In a similar study, investigating the correlation from undiluted vitreous cytokines of untreated central retinal vein occlusion with OCT, it was reported that inflammatory cytokines, IL-6 and monocyte chemoattractant protein-1 (MCP-1), were more often correlated with predictive morphologic changes such as SRD, which are clinically important in VA prognosis.28 Shchuko et al studied the concentrations of intraocular cytokines in 44 BRVO patients before and after intravitreal ranibizumab injection and compared the results with treatment efficacy. They observed that certain angiogenic (VEGF) and proinflammatory (IL-6, IL-8, IL-13, IL-15, MCP-1) factors appeared to be significantly suppressed after ranibizumab injection, and clinical efficacy of the therapy correlated with the degree of cytokines supression.29 Funk et al also demonstrated that anti-VEGF monotherapy has an impact on the expression of VEGF and on other inflammatory markers.30 Better anatomic outcomes after intravitreal ranibizumab injection in the SRD group of our study may be explained by these factors. In this retrospective study, our results suggest that VA and CMT can be improved by intravitreal ranibizumab injection in BRVO patients with and without SRD. However, more marked improvement of macular morphology was achieved in patients with SRD than those without SRD. This may be explained by the strong association of the inflammatory factors and extensive morphological changes with the occurrence of SRD, thus revealing better anatomic outcomes. The limitations of this study were its retrospective nature, assessment of single injection results, short follow-up time, a small sample size, lack of investigation of BRVO patients with only SRD, lack of the ratio or actual amount of CME in SRD group, lack of functional mapping by microperimetry (macular sensitivity), and long-term results of these eyes. Identification of characteristics that influence the treatment response to ranibizumab would help to build up more effective management algorithms for different subtypes of ME secondary to BRVO. This study is not sufficient to reach definite conclusions. Randomized, controlled, and comparative trials, with a greater number of eyes and a longer follow-up time, are needed to confirm the role of SRD as a predictive factor in BRVO eyes with ME treated with ranibizumab. This study was presented at the 14th European School for Advanced Studies in Ophthalmology Retina Academy, Istanbul, November 13–15, 2014, and an abstract of this study has been published in Ophthalmologica. 2014;232:91. The authors have no financial or proprietary interest in any product, method, or material described herein, and report no conflicts of interest in this work. Yamaguchi Y, Otani T, Kishi S. Serous macular detachment in branch retinal vein occlusion. Retina. 2006;26(9):1029–1033. Sekiryu T, Iida T, Sakai E, et al. Fundus autofluorescence and optical coherence tomography findings in branch retinal vein occlusion. J Ophthalmol. 2012;2012:1–8. Channa R, Smith M, Campochiaro PA. Treatment of macular edema due to retinal vein occlusions. Clin Ophthalmol. 2011;5:705–713. Glanville J, Patterson J, Mccool R, Ferreira A, Gairy K, Pearce I. Efficacy and safety of widely used treatments for macular oedema secondary to retinal vein occlusion: a systematic review. BMC Ophthalmol. 2014;14(14):7. Noma H, Funatsu H, Mimura T, Tatsugawa M, Shimada K, Eguchi S. Vitreous inflammatory factors and serous macular detachment in branch retinal vein occlusion. Retina. 2012;32(1):86–91. Noma H, Funatsu H, Mimura T, Shimada K. Comparison of the efficacy of intravitreal triamcinolone acetonide for cystoid macular edema with versus without serous retinal detachment in branch retinal vein occlusion: influence on macular sensitivity and morphology. BMC Ophthalmol. 2012;12(1):1–10. Brown DM, Campochiaro PA, Singh RP, et al. Ranibizumab for macular edema following central retinal vein occlusion: six-month primary end point results of a phase III study. Ophthalmology. 2010;117(6):1124–1133. Campochiaro PA, Heier JS, Feiner L, et al. Ranibizumab for macular edema following branch retinal vein occlusion: six-month primary end point results of a phase III study. Ophthalmology. 2010;117(6):1102–1112. Ota T, Tsujikawa A, Murakami T, et al. Subfoveal serous retinal detachment associated with extramacular branch retinal vein occlusion. Clin Ophthalmol. 2013;7:237–241. Keane PA, Sadda SR. Predicting visual outcomes for macular disease using optical coherence tomography. Saudi J Ophthalmol. 2011;25(2):145–158. Otani T, Yamaguchi Y, Kishi S. Movement of intraretinal fluid from distant branch retinal vein occlusion to the submacular space. Clin Ophthalmol. 2013;7:81–86. Tsujikawa A, Sakamoto A, Ota M, et al. Serous retinal detachment associated with retinal vein occlusion. Am J Ophthalmol. 2010;149(2):291–301. Karacorlu M, Ozdemir H, Karacorlu SA. Resolution of serous macular detachment after intravitreal triamcinolone acetonide treatment of patients with branch retinal vein occlusion. Retina. 2005;25(7):856–860. Noma H, Funatsu H, Mimura T, Shimada K. Visual function and serous retinal detachment in patients with branch retinal vein occlusion and macular edema: a case series. BMC Ophthalmol. 2011;11:29. Battaglia Parodi M, Isola V. Branch retinal vein occlusion and exudative retinal detachment: pathogenetical aspects. Ophthalmologica. 1994;208(1):29–31. Spaide RF, Lee JK, Klancnik JK, Gross NE. Optical coherence tomography of branch retinal vein occlusion. Retina. 2003;23(3):343–347. Daruich A, Matet A, Moulin A, et al. Mechanisms of macular edema: Beyond the surface. Prog Retin Eye Res. 2018;63:20–68. Dacheva I, Ceglowska K, Nobl M, et al. Correlation from undiluted vitreous cytokines of untreated central retinal vein occlusion with spectral domain optical coherence tomography. Klin Monbl Augenheilkd. 2016;233(7):864–868. Murakami T, Tsujikawa A, Miyamoto K, et al. Relationship between perifoveal capillaries and pathomorphology in macular oedema associated with branch retinal vein occlusion. Eye. 2012;26(6):771–780. Marmor MF. Control of subretinal fluid: experimental and clinical studies. Eye (Lond). 1990;4(Pt 2):340–344. Cinal A, Ziemssen F, Bartz-Schmidt KU, Gelisken F. Intravitreal bevacizumab for treatment of serous macular detachment in central retinal vein occlusion. Graefes Arch Clin Exp Ophthalmol. 2011;249(4):513–520. Spaide RF, Chang LK, Klancnik JM, et al. Prospective study of intravitreal ranibizumab as a treatment for decreased visual acuity secondary to central retinal vein occlusion. Am J Ophthalmol. 2009;147(2):298–306. Pieramici DJ, Rabena M, Castellarin AA, et al. Ranibizumab for the treatment of macular edema associated with perfused central retinal vein occlusions. Ophthalmology. 2008;115(10):e47–e54. Gallego-Pinazo R, Dolz-Marco R, Pardo-López D, et al. Ranibizumab for serous macular detachment in branch retinal vein occlusions. Graefes Arch Clin Exp Ophthalmol. 2013;251(1):9–14. Pfister M, Rothweiler F, Michaelis M, et al. Correlation of inflammatory and proangiogenic cytokines from undiluted vitreous samples with spectral domain OCT scans, in untreated branch retinal vein occlusion. Clin Ophthalmol. 2013;7:1061–1067. Koss M, Pfister M, Rothweiler F, et al. Correlation from undiluted vitreous cytokines of untreated central retinal vein occlusion with spectral domain optical coherence tomography. Open Ophthalmol J. 2013;7:11–17. Shchuko AG, Zlobin IV, Yur’eva TN, Ostanin AA, Chernykh ER. Intraocular cytokines imbalance in retinal vein occlusion and its impact on the efficacy of anti-angiogenic therapy. Vestn Oftalmol. 2015;131(2):50–56. Funk M, Kriechbaum K, Prager F, et al. Intraocular concentrations of growth factors and cytokines in retinal vein occlusion and the effect of therapy with bevacizumab. Invest Ophthalmol Vis Sci. 2009;50(3):1025–1032. Kim M, Kim Y, Lee SJ. Comparison of aqueous concentrations of angiogenic and inflammatory cytokines based on optical coherence tomography patterns of diabetic macular edema. Indian J Ophthalmol. 2015;63(4):312–317. Koytak A, Altinisik M, Sogutlu Sari E, Sari ES, et al. Effect of a single intravitreal bevacizumab injection on different optical coherence tomographic patterns of diabetic macular oedema. Eye. 2013;27(6):716–721.